A drought has many causes. High temperatures, too little rainfall causing dry lands, increased water demands and water shortages are more or less the perfect storm contributing to droughts. This past summer has been the absolute worst for the western states, with most of California, Colorado, Arizona, Texas, and New Mexico experiencing drought conditions that range from “severe” to “exceptional” for months at a time. Droughts become more frequent and longer lasting driving some states to put limitations on their water usage. Over the last two months, 85% of the western states have had to force nearly 15 million people to live under water rationing while thirty communities in Texas predict that they will be completely out of water by the end of the year. But droughts are not the only epidemic spreading like wildfire this summer. The dry conditions of our western forests are literally causing rampant wildfires that the US is having trouble containing and extinguishing. 2013, thus far, has been a sad and long story for our forests. Wildfires are consuming more acres than ever before in history. 31,900 fires have hit 3 million acres in the United States so far this year, with 40 active fires still burning in more than 6 states. 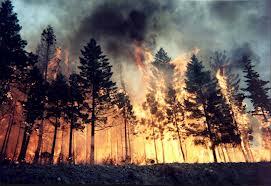 One of the largest blazes is located on the western boundary of Yosemite National Park in California. The fire has been ravaging the land burning more than 288 square miles and threatening 5,000 homes nearby, resulting in California’s governor to declare a state of emergency in San Francisco, located 150 miles away. The California “Rim Fire,” which began August 17th, has already been labeled as one of the largest wildfires in California history, and it’s still spreading. More than 4,000 firefighters are currently working on quelling the blaze, and they expect to have it contained by September 20th. However, it is impossible to predict how much destruction there will be by then. Researchers believe that wildfires will soon become more common as the temperatures get warmer and forests begin to lose their moisture. Once trees dry up, they lose their ability to resist the effects of fire and unable to protect themselves. As droughts continue to last longer what water will there be to help firefighters attack these wildfires? There is no mistaking the correlation between rising temperatures, global climate change, increasing droughts and raging wildfires. There is also no mistaking the dependency on water to extinguish these fires. This entry was posted in Environmental Concerns and tagged Droughts, Water Shortages, Wildfires on September 17, 2013 by BioHitech America. The possibility of a water shortage in America is not typically a problem in the mind of the everyday citizen. And yet, a lack of fresh water is rapidly becoming an issue within the United States. Water shortages have already come into effect in Midwestern areas of the United States, where temperatures are high and droughts are frequent. For example, the city of Lehi, Utah has already initiated certain restrictions on its public’s water usage. Due to a lasting drought, many citizens began using their own household faucets to water their lawns, consequently causing a dearth of culinary water (drinking water). If the citizens do not follow the regulations set by their government, the city will potentially run out of drinking water by Friday. 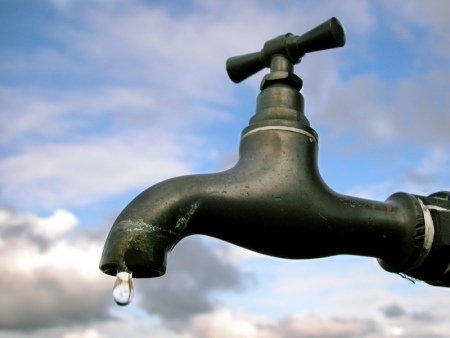 Despite popular belief, droughts are not the only cause for water shortages. The main culprits include the increases in population size and global climate change. As the number of citizens increases, so does the demand for water. In fact, according to the U.S. Intelligence Community Assessment of Global Water Security, by 2030, the global need for water will exceed its supplies by 40%. And conversely, the rising temperatures due to global warming are resulting in decreases of available water in the forms of receding glaciers, reduced stream and river flow, and shrinking lakes. In fact, the Ogallala Aquifer, located underneath many western states, is being drained at a rate of approximately 800 gallons per minute. Once the water from this aquifer is gone, there is no replacing it. In order to prevent such devastating shortages, we must take action as quickly as possible. There are two major options: Water Conservation or the Development of Large Volumes of NEW Water. Another major problem evident in today’s society is the question of how to properly dispose of food waste. With the advancements made in waste management comes the Eco-Safe Digester, which is able to solve both issues seamlessly. Simply put, the machine is able to generate the “NEW” water needed to sustain our growing population, while simultaneously aiding in the solution of our nation’s massive waste crisis. Water is not a finite resource; the demand is quickly exceeding the supply. As water is a necessity of life, we must do everything in our power to create more before it is too late. This entry was posted in Technology and the Environment and tagged Eco-Safe Digester, New Water Creation, Water Shortages on July 3, 2013 by BioHitech America.